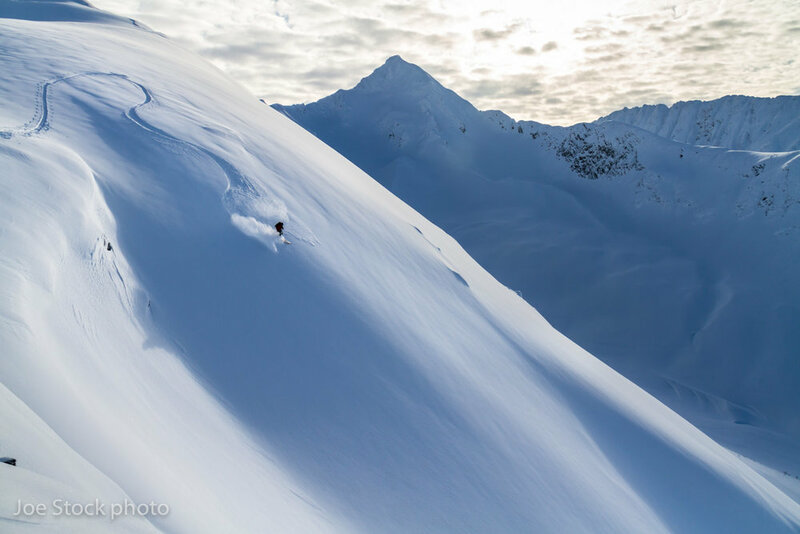 Join Joe Stock for the best skiing in the world in the mountains surrounding Anchorage. 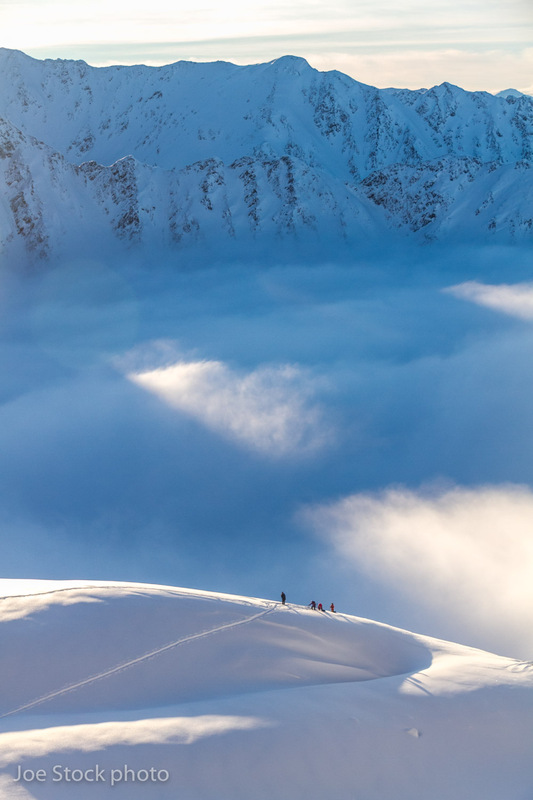 The ski zones near Anchorage offer four huge mountain ranges: the Kenai Mountains, Talkeetna Mountains, Chugach Mountains and the Alaska Range. From this vast wilderness, we find everything from open powder faces, to chutes, to glaciers and tree skiing. Whether you want a single day of touring, or you're from Outside and want a full week of adventure, Joe will show you the region like no one else. What is Alaska skiing like? Where we ski is not fixed. Joe is looking for the best conditions and terrain for you. That means we'll make a plan each day based on the weather, the avalanche conditions and your interests. We'll start with lower angle terrain for snowpack and group assessment. If conditions and group allow, we can step into steeper terrain. Or we can stay on lower angle or moderate terrain. Joe is searching for the best skiing for you. The caveat is that Joe cannot control the weather or snowpack. Alaska is the land of extremes. This phenomenon is known as The Alaska Factor. Everything is bigger—the mountains, powder, storms, avalanches, euphoria, etc. As a result, Alaska trips require a higher degree of flexibility than elsewhere. Joe will do his best to find the optimal snow and weather for skiing. 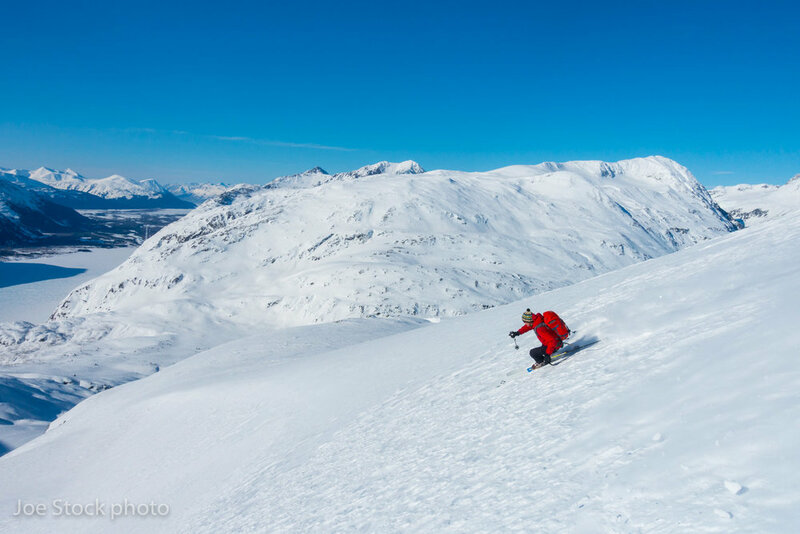 This may require shifting to a different ski zone than originally planned, such as from summit tours to tree runs, or from the Kenai Mountains to the Talkeetna Mountains. We may even fly out of the powder coated mountains under blue skies because the Joe feels the avalanche danger is too high. Going with the flow will improve your trip. Plans will change. If you are not flexible, you may be better suited for a trip elsewhere. 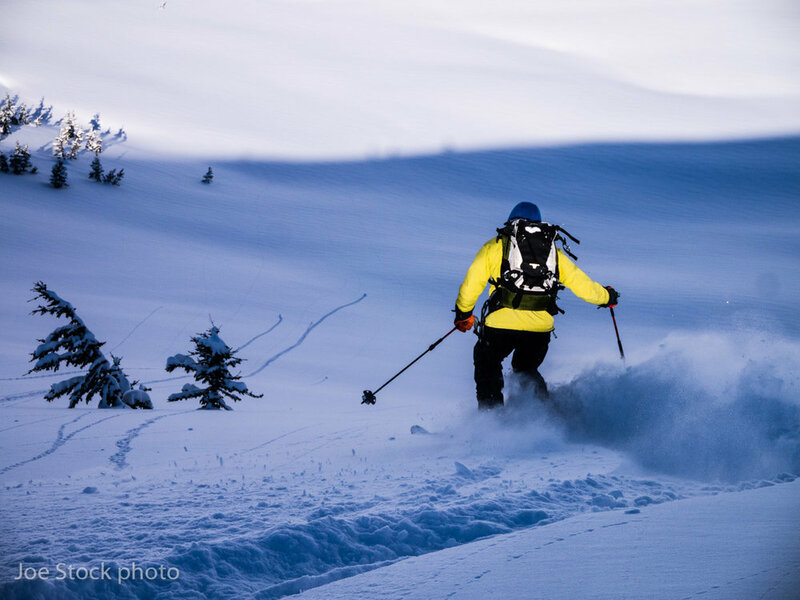 See Southcentral Alaska backcountry skiing posts. Read about backcountry skiing around Anchorage in Joe's guidebook The Alaska Factor. Joe does not provide transport. To reduce your cost, it's best to use your personal or rental car. If possible, the guide will ride with you to the trailhead. If visiting from Outside, Girdwood is an hour from Anchorage, and has all the amenities of a laid-back ski town. While we mostly ski the mountains around Girdwood, sometimes conditions are better in the Talkeetna Mountains, an hour north of Anchorage. See Southcentral Alaska Logistics. 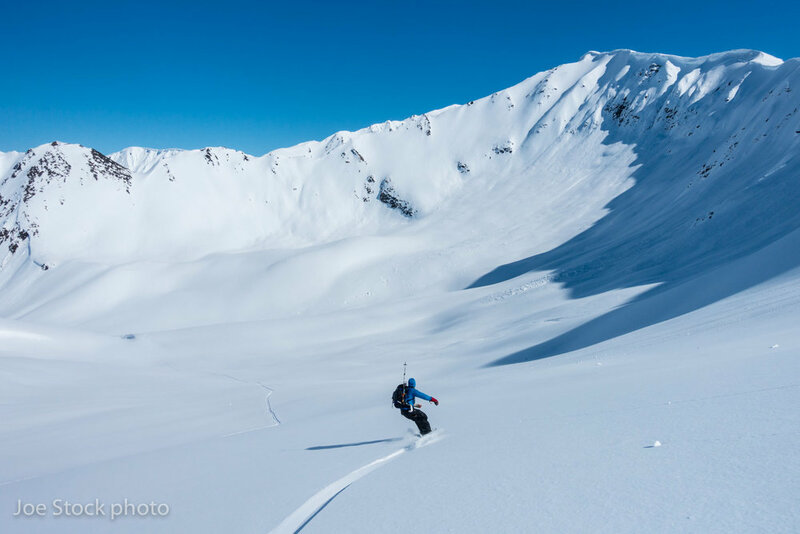 Just an hour drive from the Anchorage airport, Girdwood is an ideal place to base for your week of backcountry skiing. The small town has comfortable B&B options, plus the luxurious Alyeska Hotel. Joe will meet you each morning in Girdwood for skiing. Within an hour drive is Turnagain Pass, Summit Lake, Western Chugach Mountains and the Chugach Front Range. Two hours from Girdwood is Hatcher Pass in the Talkeetna Mountains. If the weather is marginal we have options near Girdwood. We can explore treeline linkups at Summit Lake and Turnagain Pass in the Kenai Mountains. Another option is to ski in the lee of the storm, in the Chugach Front Range or Talkeetna Mountains. Joe knows how to find good skiing in all weather for all abilities. 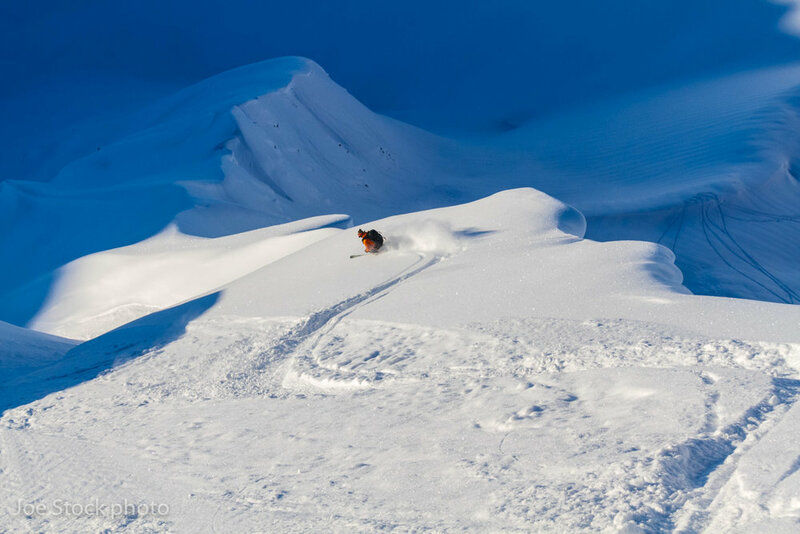 Heli skiing with Chugach Powder Guides. About $1,375 per person per day, total. Cat touring from the Alyeska Hotel with Chugach Powder Guides. Area skiing at Alyeska Ski Resort. 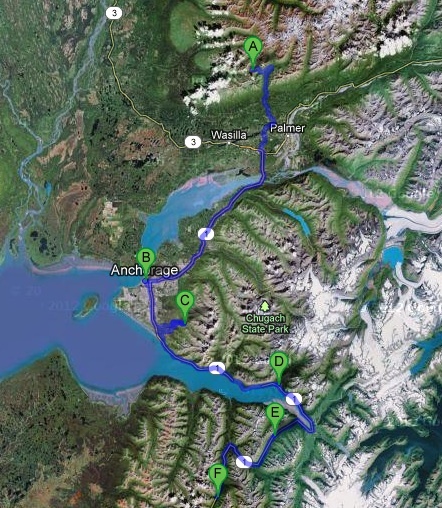 A) Hatcher Pass, B) Anchorage, C) Chugach Front Range, D) Girdwood, E) Turnagain Pass, F) Summit Lake. Fitness for a full day in the mountains. October through June. March and April are best for long days and stable snow in Southcentral Alaska. In midwinter we have seven hours of day light—enough for a big day in the backcountry. By mid-March we have 12+ hours of sunlight. 4+ clients: $200 per person per day, a second guide may be added over four clients. 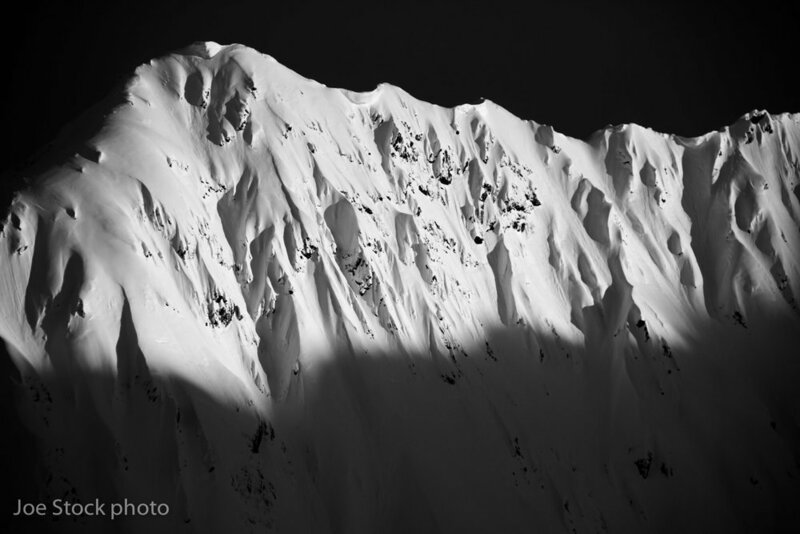 Photos of backcountry skiing in Southcentral Alaska.